The redesign of the Mazda3 hatchback was partly about ensuring ride comfort. One has to admit, this 5-door iteration of the Mazda3 sedan is a great looking vehicle. Our test car came in Soulful Red metallic (an extra $300); a real stunner teamed with cream-color perforated leather-trimmed sport seats. The Mazda3 cabin is equipped with several new advanced features, choices of trim levels and some slight body panel changes. 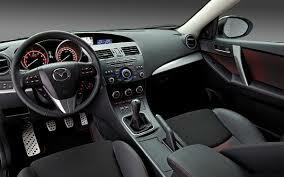 The base engine in the Mazda3 is 2.0-liter, 155 horsepower, with an optional 2.5-liter with 185 horsepower. Our Grand Touring model came equipped with the 2.5-liter and we canâ€™t imagine anything less powerful. Fuel economy was over the reported 31 mpg. by a little, but impressive. Our driving included mostly around town, with a few short highway driving trips. The liftback is smooth and agile, and makes one think, if ever so slightly, that they might be driving the MX5 Miata. We found the navigation system to be a tad annoying. Most often this writer can figure out the way each system works, and they are somewhat different in operation. The one in the Mazda3 was not as easily operated as some. One other complaint is the road noise. I found myself reaching over to the driverâ€™s side window several times thinking the window was ajar. Not so. Itâ€™s just that you can hear the road more than expected. All-in-all, though, we really enjoyed our time in the Mazda3 liftback. A versatile wagon, we found the 2.5-liter, 4-banger adequate for most driving conditions, appreciated the fuel economy and resonated with its agility and sportiness. One of the best all-around compact cars/hatchbacks, the Mazda3 gets a â€˜5â€™ in crash test scores, offers fairly quick acceleration and probably rides a little softer on the 16-inch standard tires. The 18-inch tires, however, provide better handling. Our test Grand Touring model came equipped with the 18-inch tires making for a little more of a choppy ride. We preferred them though, and would probably go for that option if ordering. Trim levels include the 3i Sport trim, which is now the base model. The SV has been dropped, and the 3i Touring and Grand Touring and 3S Touring and Grand Touring added. Transmission choices include the standard six-speed manual and optional six-speed automatic with paddle shifters. A manual transmission is no longer available on the Sport trim level. Optional equipment on our Mazda3 S Grand Touring included cargo mat ($70), cargo net ($60), Soul Red Metallic paint ($300), Mazda mobile start ($550), door scuff plates/door sill trim plates ($125), rear bumper guard ($100), and appearance package (front air dam, door mirror caps, rear hatch spoiler, $1,750). This newly designed 2016 Mazda3 hatchback is a looker, fun to drive and so Mazda-ish. We really enjoyed driving the Grand Touring edition and at a little over $30,000 would definitely consider it when thinking about a practical purchase. More features have been added to the 2016 Mazda3. For one, a rearview camera, automatic headlights, automatic wipers and a sunroof are standard trim on the Sport trim level. Competition for the Mazda3 hatchback includes the 2016 Ford Focus, 2016 Kia Forte and 2016 Honda Civic. Fuel Tank Capacity: 13.2 in. EPA Fuel Economy: 29/40 mpg. The word minivan and â€œsettlingâ€ are often in the same sentence when discussing this most practical of vehicles. This writer isnâ€™t afraid to admit the minivan is her favorite mode of transportation. Having owned a Dodge Caravan for a few years, there are times still, when I miss it terribly. Todayâ€™s minivan is far from boring, in looks, amenities and practicality. 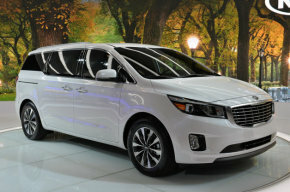 The redesigned 2016 Kia Sedona is a good example of what this 7-passenger box on wheels can look like and offer. With a price tag now upwards of $44,000, one would assume there is plenty to offer, including the latest in technology, lots of standard features and sought-after options. A compelling choice among those minivans still available-Honda Odyssey, Toyota Sienna, Dodge Grand Caravan, Chrysler Town & Country, Nissan Quest and the soon-to-be gone Mazda5-the Sedona is available in four trim levels (L, LX, SX, SX-L). Our test vehicle, top-of-the-line SX-L came equipped with about every convenience and safety feature youâ€™d expect, as well as a few options. 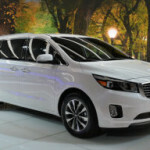 Dressed in a striking design, the Kia Sedona we drove was a â€œSnow White Pearlâ€ with wood grain, metallic accents and tweed-type Nappa leather seating. Tri-zone automatic climate control, Infinity Surround Sound audio, Memory driver seat, push button start, heated steering wheel and heated/cooled seats, and front/rear parking assist. We didnâ€™t especially like the optional Lane Departure Warning System. Every time the vehicle crosses lanes, it goes off. This feature is available in Kiaâ€™s SXL Technology Package (Surround View Monitor, Smart Cruise Control, Chrome Side Sill Trim, Xenon HID Headlights w/High Beam Assist, Forward Collision Warning System, and Luggage Zone115V power inverter,$2,500. The only other option on our SX-L Sedona was the rear-seat entertainment system, $1,095. The Sedona offers a quiet, confident ride, on the highway or around town. Controls are at your fingertips and as with all minivans, there is immense interior space. Our test Sedona came equipped with second row â€œFirst Class Lounge Seating,â€ much like Captainâ€™s chairs. The headrests on these seats are immense and made seeing out of the back of the van, difficult. The view was largely compromised when trying to determine traffic on the passenger side of the van. The Captainâ€™s chair second-row seating is standard on the SX-L trim level. They recline about 25 degrees horizontally and sections below the seat cushions extend to become footrests; much like airline seating. The middle row seats are track-mounted and fold up and slide forward to stack up against the front row. The third row seats fold below the floor level. Driving to the office this morning I noticed an older Sedona ahead of us. I found myself thinking a moment as I wondered if it was an SUV, then realized the earlier minivans looked quite different; smaller in dimensions. The 2016 Sedan is a different animal, much improved and updated. The new front fascia on the 2016 Sedona is unmistakenly Kia, featuring the signature â€˜tiger nose.â€™ LED accent headlights are also new. In the rear there is a roof spoiler and LED taillights. Known in earlier iterations for its value (as a simple minivan), the redesigned Sedona will now be known as a â€œmultipurposeâ€ vehicle. Starting at $27,295 for the entry L trim level, the SXL starts at $41,000. Fuel tank capacity: 21.1 gal. EPA fuel economy: 18/24 mpg. Redesigned in 2015, the Toyota Camry enjoys a little more style than previous designs. Not a terribly exciting sedan, the Camry nevertheless, does extremely well in the marketplace. After having driven the 2016 Hybrid version, itâ€™s clear why. This is the first Camry this writer has been enthusiastic about. This hybrid version of the popular 4-door sedan is a delight to drive. Not only is it whisper quiet, the seats are very comfortable and supportive, and the acoustics easy to live with. More so, though, we were especially impressed with Toyotaâ€™s 2.5-liter, 4-cylinder Hybrid engine. When selecting a Camry Hybrid, engine choice will be easy. They all feature the same 2.5-liter 4-cylinder gasoline-electric hybrid engine, which produces 156 horsepower. Fuel Economy is good: the Hybrid LE delivers up to 43 mpg city/39 mpg highway, while the sporty Hybrid SE and XLE offer up to 40 mpg city/38 mpg highway. Drivers can keep an eye on how the power is being routed, or battery charged by the energy monitor. All Camry Hybrid trim levels feature three selectable driving modes that allow for various types of driving: Normal, EV and ECO mode. These modes not only affect the Hybridâ€™s ride, but also determine the ratio of electricity to gas used by the engine. The three trim levels include LE, SE and XLE. Our test Camry Hybrid was the SE model, with a total vehicle price of $29,820. One expects to pay more for a Hybrid version of any vehicle on the market today. We found the SE model to be just about right, including features we would want. The LE entry-level trim version offers quite a few nice features, including 8-way power adjustable seats, dual-zone automatic climate control, an integrated backup camera, Entune audio with 6.1-inch touch screen display and keyless entry/push-button start. This is all consumers get-which is a lot, at $26,800. Sorry, no options available. The SE Hybrid sedan is equipped with 17-inch alloy wheels, a stiffer sport-tuned suspension, rear spoiler, and leather trimmed steering wheel. The SE allows for some fun when driving a Hybrid car. Often thought of as â€˜dull and utilitarian, Toyotaâ€™s Camry Hybrid version offers an opportunity to inject a bit of fun into the hybrid experience. Additional options include a power tilt/slide moonroof and Entune Audio Plus with navigation, Entune Premium Audio, and Qi-compatible wireless smartphone charging. The XLE Camry version offers top-of-the-line luxury. Features include leather upholstery, heated front seats, Entune Audio Plus with navigation and SiriusXM features, LED daytime running lights, an auto-dimming rearview mirror and 17-inch alloy wheels. The available optional packages include features like power tilt/slide moonroof, Entune Premium JBL Audio with navigation, blind spot monitor, Qi-compatible wireless smartphone. Once again, Toyota has done it up well. As anyone out on the road knows, Camryâ€™s outnumber many available sedans today. Pricing is reasonable, the dash is well situated, easy to read and most functions intuitive. The fuel economy, of course, goes without saying. We drove the Camry Hybrid to Jolietâ€™s Autobahn this week and enjoyed a very relaxing, satisfying ride. A fellow autowriter commented several times what a nice sedan it is. Fuel Tank Capacity: 17.1 gal. Reigning champ Kristen Yeley (wife of driver J.J. Yeley) will look to defend her title as she and other wives and girlfriends of NASCAR drivers look to compete in the 5th annual Better Half Dash on October 8th at Charlotte Motor Speedway. This yearâ€™s lone-up also includes: Denny Hamlinâ€™s girlfriend Jordan Fish; Sandra Greenfield, wife of NASCAR driver Clay Greenfield; Shannon Koch, wife of driver Blake Koch; Tatiana Papis, wife of NASCAR driver Max Papis; Jenna Robinson, wife of NASCAR pit crew member Clay Robinson; Brian Scottâ€™s wife Whitney Scott; Melanie Self, representing Motor Racing Outreach; Ashley Stremme, married to NASCAR driver David Stremme; Katelyn Sweet, Klye Larsonâ€™s girlfriend; and Wendy Venturini, NASCAR analyst for Fox Sports 1 & PRN. The husbands and boyfriends will not only be cheering their ladies on, but also serve as crew chiefs and spotters for them, before attempting to qualify in knockout rounds to set the field for the only Saturday night race in the Chase, the Bank of America 500. Bojangles’ Pole Night. The evening wraps up with the ground-pounding action of the NASCAR Whelen Southern Modified Tour doing battle on the front stretch quarter-mile as the best modified drivers on the planet race to decide the championship. Early afternoon practice sessions for Sundayâ€™s Drive for the Cure 300 presented by Blue Cross Blue Shield of North Carolina Xfinity race. The women, who will be driving US Legend Cars International Bandoleros for 25 laps (a total of 6.25 miles) along CMSâ€™ Â¼-mile front stretch oval will be out to show that they can be just as competitive and aggressive as the men in their lives as they raise money to support organizations such as Motor Racing Outreach and Speedway Childrenâ€™s Charities. In fact, the winning driver will earn $10,000 for charity: $5,000 for her favorite charity, as well as $2,500 each for Speedway Childrenâ€™s Charities and Motor Racing Outreach. Competition for the Mitsu Outlanader Sport includes Subaru Crosstrek XV, Nissan Juke, Jeep Compass,and Kia Sportage; all very popular models, making it a harder choice to make. The Toyota RAV4, Ford Focus and Elantra GT are probably more akin to the Outlander; a small wagon-type SUV. 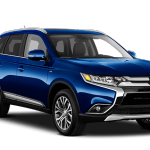 Optional equipment on our test Outlander SE included Navigation System 7-inch touch screen, high def., 3D mapping/mapcare, 2 annual map updates, Real time, traffic; Leather seating surfaces, 710W Rockford Fosgate sound system (9 speakers, 10-in. subwoofer punch-control, DTS, neural surround premidia-wide surround and Dolby volume; auto dimming rearview mirror; power driver seat; Panoramic glass roof with LED illumination; and Black roof rails ($4,900). The best features on the Mitsu Outlander were the panoramic roof with LED lighting and the Rockford Fosgate sound system. The SE trim level is top-of-the-line so of course, it carries a heftier pricetag. This writer still thinks with a total vehicle price hovering under $30,000 is a lot for this vehicle. Trim levels include the 2.4 ES, 2.4 GT, ES and SE. While not a bad little SUV with some positive attributes (Nimble, spacious), the Outlander also lacks much of what its competitors offer in this market. We would balk at the MSRP for starters-not wanting to pay out this kind of cash for a simple, non-responsive small sport-ute. The interior is drab, dated, yet somewhat spacious. Attempting to conquer the highway on ramp needs to be done with a prayer as Mitsubishiâ€™s 4-cylinder engine is sluggish and not very refined. The Outlander takes several minutes to get up to speed. We donâ€™t like slamming the Outlander. Itâ€™s not a bad vehicle, really. Just inadequate and not very special. Although, we understand being â€˜specialâ€™ in todayâ€™s automotive marketplace is near impossible. What hasnâ€™t been thought of, executed and put out there for consumption? Generally, Mitsubishi has offered engines that are adequate and long-lasting (think: 3000 GT in the 90s). We suspect the 4-cylinder 2.0-liter will be somewhat trouble-free. It just doesnâ€™t seem enough: Give it a little more horsepower. The new squarish-designed front bumper is distinctive , and the Outlander sports a new rear bumper design, along with blocked-out body trim. The Outlander is also available in all-wheel-drive which makes it more competitive. Consumers will find that features are generous–with steering-wheel audio controls, remote keyless entry, alloy wheels, and a 140-watt sound system all standard. LED running lamps have been added for 2015. But â€œvalueâ€ lies more in the entry-level Outlander. Fuel Tank Capacity: 16.6 gal. Gross weight: 4,343 lbs., curb: 3,021 lbs.